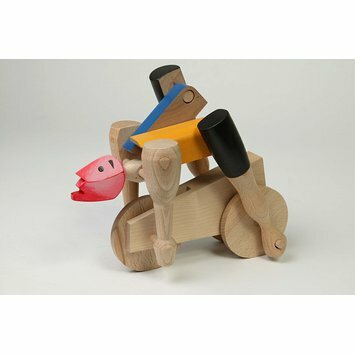 This toy, in the form of a bicyclist, was made in the 1990s in the Czech Republic and is a contemporary version of the push along toy. It conforms with European safety regulations and was no doubt made for export. 1. 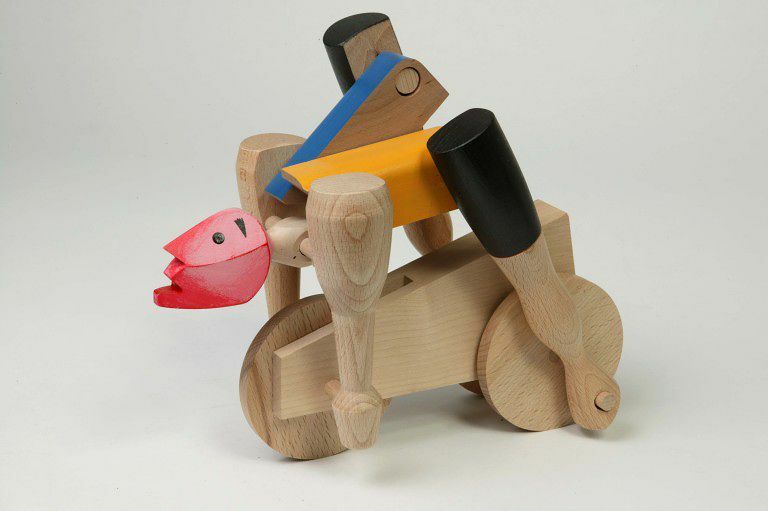 Wooden push along toy in the form of a cyclist in a race position with head down. The wood appears to be beech, it has been turned and carved then smoothed. It has not been polished or varnished and there remain some roughened parts as well as sharp points. The base is a wedge shape to which is attached on wooden pegs two rear wheels and a single front wheel. The body of the cyclist is in two halves; the left is painted yellow and the right mid blue. The legs are independently pegged to the body halves, while the arms are linked through the body halves. The leg tops are painted black. There is a second peg linking the upper arms to which the head is attached. At the back of the head the neck stretches out to form a wedge which is pushed up and down by the movement of the body halves. The head is stylized in shape; rather like a tulip; and painted shades of bright pink with black eyes and brows. When moving; the 'feet' attached to the rear wheels move up and down and force the body halves to move up and down; which in turn nods the head. The arms remain stationary. 2. carrier bag; brown thick paper printed on one side to show four early illustrations of craftsmen and the names and addresses of the various shops in the group. This toy was bought from a shop situated at 12 Karlova in the Old Town, Prague. The shop sold wooden toy originals. The toy was bought with a pull along duck toy (B.396-1994) and another of a man with string hair (B.397-1994). The design for this toy won the Bavarian State Prize for Design in the mid-1990s.